When most people think of methods of protection against cyber-attacks, firewalls, encryption, and anti-virus software may be the first things that come to mind. But there is more to cybersecurity that happens behind the scenes than you may think. 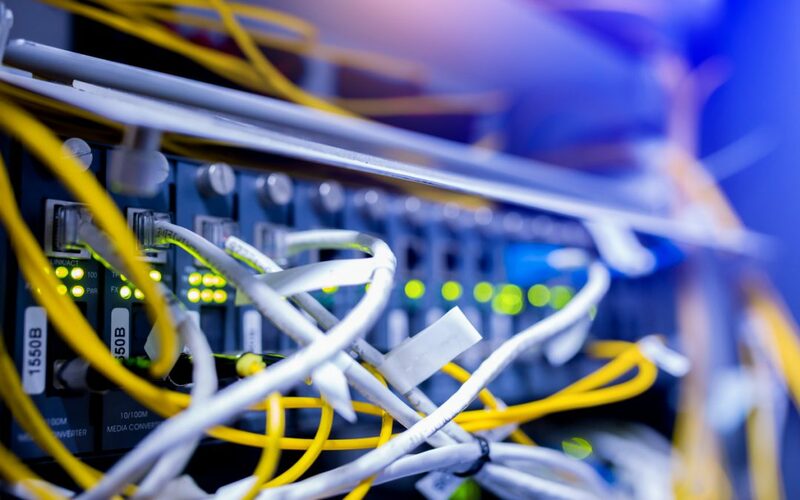 As any cabling contractor in Chicago can tell you, your cabling infrastructure can also have a big impact on the strength of your cybersecurity. Wiring may just seem like behind-the-scenes infrastructure. After all, a cable is a cable right? Well-organized cabling is just an aesthetically pleasing way of organizing them and messy cabling only makes repairs more difficult, right? Your choice of cables, quality of installation, and more can have huge impacts on your ability to weather a cyberattack. There’s a lot that goes into your choice of cable. A cabling contractor in Chicago could have dozens of types for you to choose from. Do you want fiber? Copper? Cat6? Cat5? You may be tempted to make your choice based purely on budget alone. While the cheapest cable isn’t necessarily the worst cable, it’s not smart to decide without taking anything else into consideration. For example, what types of cables do you currently have in your office? Are you planning on upgrading your systems anytime soon? Copper cables are easily color-coded, making accidental intrusion more difficult or disconnecting critical infrastructure. However, when you choose a fiber cabling solution, you can rest easy knowing that tapping into a fiber system is near impossible- not completely, but nearly. Choosing between Cat6 or Cat6e can be a more difficult decision. Cat6e may be able to transmit information faster, but Cat6 is more compatible with your current systems. After looking at all the pros and cons of each, make sure that whatever your choice is, you use it consistently and for the proper systems to avoid issues with incompatibility. Redundancy can help your business survive a disaster situation, whether that’s natural or cyber, by allowing your business to remain in service with backup equipment and alternate communication systems. Your cabling contractor in Chicago can have a large impact on your network’s redundancy. Without the right cabling solutions, one hack or virus could wipe out your systems. Connecting your network to a backup power supply can help maintain your cybersecurity protections even in the event of a power outage. A loose wire in your car can have an impact on everything from your car’s ability to start to its ability to stop. The last thing you want in a car is unreliable brakes. A loose wire in your office cabling can create network connectivity issues. Has your internet ever dropped suddenly? Or your computer died when you could have sworn it was plugged in? Loose wires in your office can create all sorts of issues, from just annoying to truly harmful. If your network isn’t receiving an adequate power supply, it could be draining your backup power source, leaving you high and dry in the event of a disaster. Network downtime can lead to productivity issues as employees struggle with getting their computer connected instead of focusing on their workload. Call a high-quality cabling contractor in Chicago for your installation. You don’t want to find yourself with disorganized loose cables costing you more than you care to spend on lost productivity. Smart door locks. Bluetooth trackers. Smart kitchens. Wireless home energy monitors. The world of IoT is continuing to spread. Soon we’ll have IoT everything, including your office. But do you have the cabling to let your office evolve with the future? It’s important to consider the future when installing your cables. And not just when it comes to your choice of Cat5 or Cat6. A professionally-designed cabling system can be integrated easily with IoT. The last thing you want to do is to have to replace your entire cabling system just to update your office. As technology continues to evolve, you need to be able to evolve with it. Working with the right cabling contractor in Chicago can set you up for a bright future. Without the right cables, you’ll find yourself quickly stuck in the past. A bad cabling installation can have a big impact on your cybersecurity. Without high quality installation, you’ll find yourself with messy tangled cables. Messy cables aren’t aesthetically pleasing and can be a large eyesore in your office. But they also cause physical safety hazards. Messy wires can create a tripping hazard and loose wires could cause fires and pose an electrocution risk. Messy cables can also cause cybersecurity risks. When cables are disorganized it’s much easier for your cabling contractor in Chicago to accidentally unplug the wrong cable or connect two disparate systems. This could have huge consequences without the proper backup, taking down your cybersecurity systems and leaving you open to cyberattacks. A cabling contractor who doesn’t know what they’re doing could also set you up for failure. Your security breach protections rely on a fast network speed. Without the right set up, your network speed could drop, leaving you open for attack. Working with the right cabling contractor has a significant impact on your company. Get in touch with a reliable, dedicated, and expert cabling contractor in Chicago today. Medlin communications has decades of experience in cabling installations and cybersecurity protections. We can provide you with the best products from great vendors to give you the best network solutions for your company.